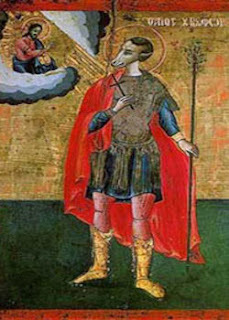 Saint Martyr Christopher is an important saint in the Christian memory both in the West and in the East, his name being in the same time the definition of his beautiful Christian life: “Christo-phoros” means in greek “Christ-Bearer”, and because of that, he is often represented as carrying Jesus the Child on his shoulders. 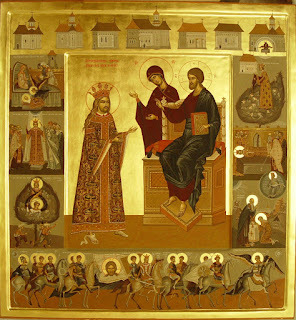 Many times, the Christian believers can see his other icon, which is quite strange, because the saint has a dog-head. This thing is quite rare in the Christianty and may be associated with the old Egyptian iconography of the god Anubis, who is represented with a jackal-face, but a human corpse. 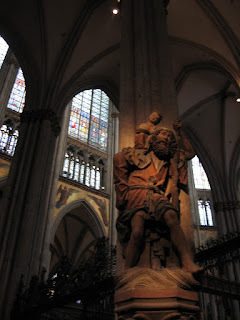 This ancient god is the protector of the souls passing from this life to the eternal, so it is quite interesting that St. Christopher is also the protector of the travelers and passengers. 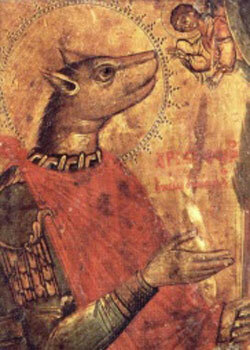 The probable existence of the mean with dog-heads is curiously mentioned not only in the history of St. Christopher. First, the ancient historian Ktesias (5th century BC) speaks in his book, Indica, about the indian tribe of kinokephaloi. His assertion is taken later by the Churchfathers like Patriarch Photius. Further, in the histories about the trips of Alexander the Great in India, the men with dog-heads are met in the desert of Gedrosian (today in Pakistan). Later, a Byzantine Historian, called Tzetzes (12th century) speaks about an entire people of kinokephaloi, who live somewhere in the farthest lands of India. Also Marco Polo spoke about this kind of human beings, living somewhere in the indan islands. Marco Polo mentions that those people are modeling their faces since a very young age, so we can understand that the dog-face is not a real one, but one imposed by some barbaric customs of (probably ritual) auto-mutilation. In the greek version of Christopher’s life, he came in the Roman Empire through the lands of the Persians, so it could be believed that he came from India, maybe from this tribe. St. Christopher appears in icons even from the 4th century, in two formulas: one in which he carries Christ on his shoulders, as we have already mentioned, passing through a river. He bears a stick in his right hand, which miraculously has leaves. The second icon is the one in which he is represented with a dog-head or lamb-head. The first representation occurs oftener in West, and the second in the Eastern Churches. The third representation, met in the monasteries from the northern Romania, shows as Christopher as a normal human, carrying on a plate a dog-head (the same kind of representation like of St. John the Baptist, which is usually for the martyrs who died by beheading). 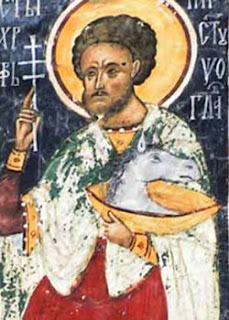 The Eastern Synaxarion and Legenda Aurea mention that St. Christopher lived in the period of the ruling of Decius, around 250 AD, but another variant of his life places him later, during the reign of Maximinus Daia, about 300 AD. The latin legend names him as a Cannanite, but in the meantime the Synaxarion says that he came from the Eastern Lands beyond Persia. Both histories mention about the hateful-looking of this giant soldier of the Roman Empire, who had a good heart and tried to help the captive Christians. His name is “Reprobus”, a Latin name who sends to the understanding of his ugliness. On the second variant, Christopher was a very beautiful man who prayed to the Lord to take from him his beauty, because he provoked scandal among the women. In the end, God hears his praying and makes his face like a dog one. This is the beginning of the history. The story of a beautiful man ends here, being in fact a legend about the modesty and against the lust. 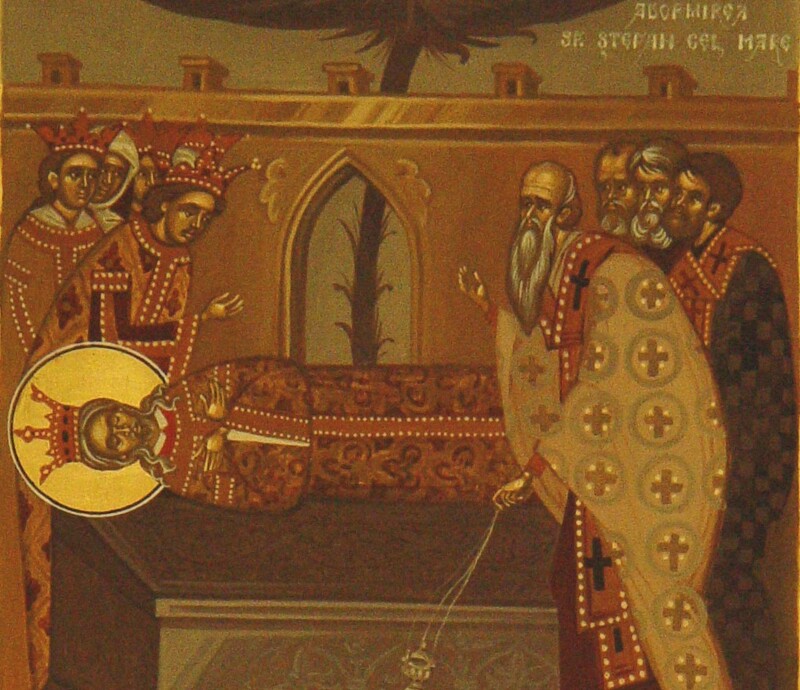 But the Byzantine Vita is longer: is a life of a martyr. In In the Legenda Aurea, Reprobus, serving firstly to a Canaanite king, sees him crossing himself when speaking about devil, and that’s why he understood that the cross can help him against the evil. So, because he wanted to serve Christ and didn’t know how, an hermit says to him that, being so tall, he can help the people to cross a river and this would be his mission in the world. One time he bears a child, who curiously is so heavy, that he cross the river with big difficulties. The Child presents himself as Jesus, who wanted to see him serving. That’s why he is depicted in the Western icons as carrying Jesus on his shoulders through a river. Later Reprobus go to the city of Lycia, being there a soldier in the Roman army. The Byzantine Synaxarion mentions that he had also speaking problems, being unable to say encouragements to the captive Christians. After praying, Christ “opens his mouth” and he is able to speak for them against a local persecutor, called Bachus. Because of this, he is condemned and sent to Rome, together with 200 soldiers, put to guard him. On the way to Rome, he is baptized by Babylus, bishop of Antioch, and since then he is named Christopher. Probably Christopher never went to Rome. The tradition mentions that his martyrdom occurred in Lycia, which is in fact a region in Asia Minor, so he probably died in its capital city, Myra. He scares the emperor because of his face and also because of his giant stature. According to Legenda Aurea, he was about 5 cubits (2.3 m) tall and with a fearsome face. At the beginning, the emperor tries to convince him to renounce at his faith, later sends to him two beautiful women to make him fall in love, but no success with those. Both the 200 soldiers and the two women convert themselves to Christianity and because of that are sentenced by the emperor to death. Finally, the saint is tortured, being put on an incandescent copper chair, but he speaks further about his vision of Christ, in a stronger light than the sun. In the end, after some other tortures, St. Christopher dies as a Martyr of Christ by beheading. The Eastern Orthodox Church venerates Saint Christopher on May 9. 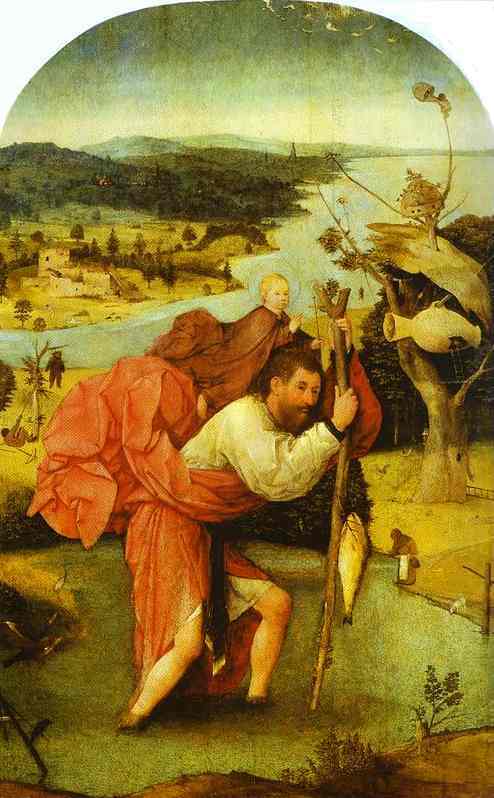 The Tridentine Calendar allowed a commemoration of Saint Christopher on 25 July only in private Masses. This restriction was lifted later (see General Roman Calendar as in 1954). Although the Roman Catholic Church still approves devotion to him, listing him in the Roman Martyrology among the saints venerated on 25 July, Pope Paul VI removed his feast day from the Roman Catholic calendar of saints in his 1969 motu proprio Mysterii Paschalis. At that time the church declared that this commemoration was not of Roman tradition, in view of the relatively late date (about 1550) and limited manner in which it was accepted into the Roman calendar, but his feast is still observed locally. In Greece, many churches place the icon of St Christopher at the entrance so that people can see it as they enter and leave the building. 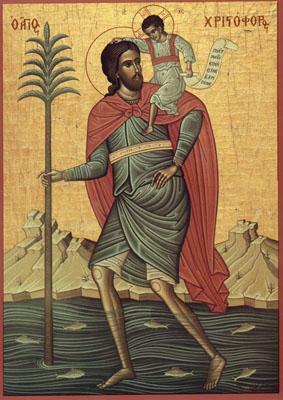 There is a small poem in Greek which says, “When you see Christopher, you can walk in safety.” This reflects the belief that whoever gazes upon the icon of St Christopher will not meet with sudden or accidental death. The relics of St Christopher were firstly in placed in a church in Lycia, and later transferred to Toledo and finally to the abbey of St Denis in France. The Church of Saint Justine from the Rab island of Croatia possesses in its museum a gold-plated reliquary which probably holds the skull of St. Christopher. 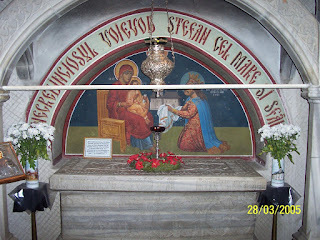 The relics came here in the 11th century, having a special honor in the local belief. The legends say that when it was placed upon the city wall, it destroyed a siege of the city by an Arabian army. Saint Christopher is the patron saint of many regions and town, such as: the ancient lands Baden, Brunswick and Mecklenburg in Germany, Saint Christopher's Island (Saint Kitts) from the Carribean Islands, town of Barga in Tuscany, Rab in Croatia; Roermond in the Netherlands, Girona in Catalonia, Mondim de Basto in Portugal, Agrinio in Greece, Vilnius in Lithuania, Riga in Latvia, Havana in Cuba and Paete in the Philippines. 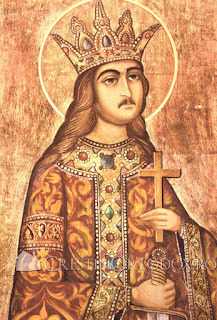 Saint Stephen the Great, known also as Stephen III Muşat (1457-1504) is one of the most celebrated saints in the modern Orthodoxy in Romania. Being a big hero of our history and big protector of the Church, ther was decided in 1992 to proclaim his saintness, being celebrated on 2nd July, in the day of his passing away. His human qualities, as a good politician, strategist and diplomat, his actions in order to protect the integrity of his country, and his cultural sensibility caused a big admiration in Moldova and in the whole Europe, and thanks to the popular tradition, was transformed into a legendary hero. 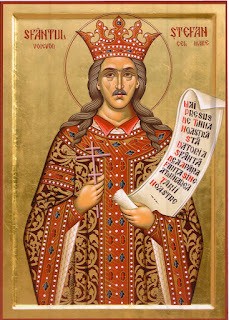 Moreover, Pope Sixtus IV called him Athleta Christi (athlete of Christ) and the people composed the ballad: ”Stefan Vodă (Prince), the great Lord, has no equal into the world but only the proudly sun”. There is quite controversial to speak about a saint like Stephen the Great, and the public media brought a lot of arguments against his saintness. In this way, there is a problem to which the modern Christians should answer: how should we define the saintness and which man/woman can be proclaimed as a saint? But to this question we will answer later. Now, we should expose shortly the life of such a wonderful man for the political and Christian history of Romania. Stephen the Great was born sometimes around 1430 in the village of Borzeşti, being the son of the Voivode Bogdan II Muşat of Moldova (1449-1451) and Lady Oltea, a noblewoman in the „Lowlands” of Moldova, from the family of Basarab, the rulers in Wallachia in that time. His ancestry is, by following, a noble one. His ancestor, Bogdan I founded the principate of Moldova at the end of the 14th century, and the Family of Muşat was connected by marriages with a lot of kings’ families from the whole Europe. The young boy Stephen grew up far away from the voivodal Court from the capital city of Suceava. Probably he had some others brothers from his father’s marriages, thing that is quite unclear. Anyway, in 1451 his Uncle, Petru Aron, killed his father during a feast in Reuseni and becomes the new voivode of Moldova. In the same time, Petru Aron signs the first treaty with the ottoman Turks, so that Moldova becomes for the first time a vassal state of the Otoman empire. Petru Aron tried to kill all the pretenders of the Throne, only Stephen escapes and run in Wallachia, to his cousin, Voivode Vlad III (well known in the western literature as Dracula). Later, in 1457 Sephen comes back with military enforcements from Vlad and sieges in the battle of Doljeşti, near Suceava. Since then, he becomes the new voivode of Moldova, ruling for about 47 years. He is unctioned as voivode, after the Byzantine ritual of consecrating the emperors, by the metropolitan Teoctist of Moldova. This is the longest reign in the whole history of Romania, excepting King Carol I (1866-1914), who is the exponent of the modernization of Romania. Stephen the Great changed the internal politics since the beginnings. He restraints the rights of the noble families, even punishing many of them to death. One of the preferred punishments in the Middle Ages was the impaling, and Stephen doesn’t make any exception from that rule. This thing will be controversial for the judging his saintness. Anyway, we must understand his way of ruling in the mentality of the Middle Ages, which was not such humanistic in the way we understand today. 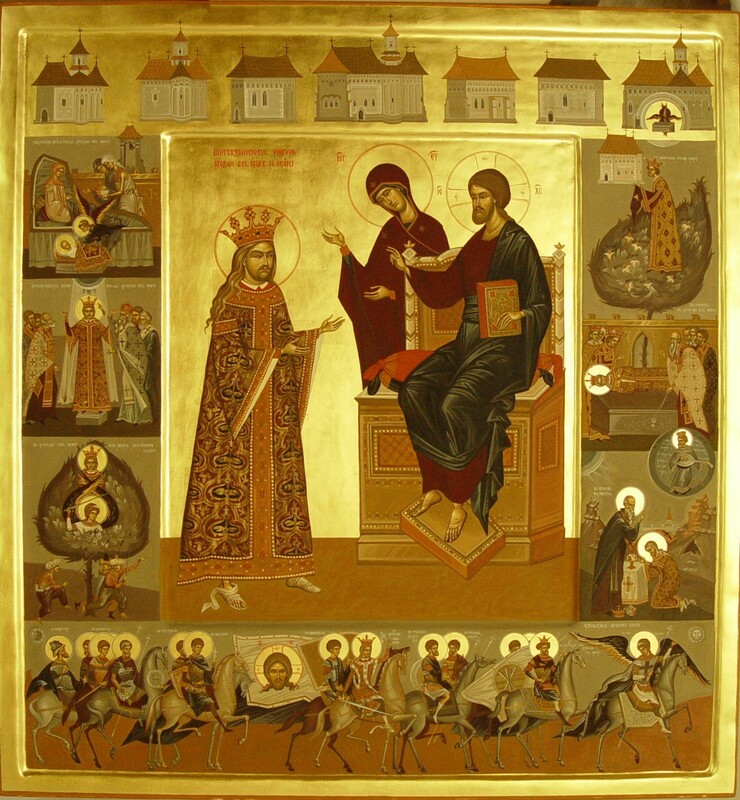 The local tradition tells that Stephen was confessing to an ascetical father from the Carpathian Mountains, known as Daniil Sihastrul (“The Hesyhcast” + 1497, also a saint), who counseled him not only in the spiritual, but also in his political actions. The political situation of Moldova was very difficult, being situated in the sphere of influence of three great powers: the Ottoman Empire, who conquered under Mehmet II the Constantinople in 1453, the Kingdom of Hungary, ruled by Matthias Corvinus, and the Kingdom of Poland, ruled by Casimir IV. So, the political purpose of Stephen was to maintain the equilibrium between them and also to remain independent, as much as possible. That situation was but very difficult, and he was obliged to bear about 50 wars against those kingdoms and also against the Tatars who came quite often, destroying everything. Stephen replaced all the noblemen who had another interest than protecting the country. Sometimes, after a battle, he named as noblemen some peasants, and punished the traitors. Also he was interested in building strong fortresses at the borders of the country, which proved to be very important in the later politics. Stephen opened an interesting tradition, so after every battle he was building a church or a monastery, even if winning or losing it. His mentality was, that even in the battle against the enemies, killing the invaders is still a sin, so he wanted to build a church for the souls of the dead soldiers, Moldavians or enemies. Also, after all the battles he was fasting for a period and he obliged also his soldiers to fast, in order to be cleaned by the sin of killing. 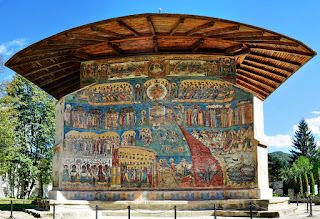 Between the 44 documentary attested churches built by his command, there is worthy to mention the reconstruction of Neamţ Monastery, an important cultural centre for the whole history of Romanians, the Voroneţ Monastery, known also as “The Oriental Sixine Chapel”, because of the beautiful painting and the well-known scene of the Last Judgement, and Putna Monastery, where he was buried. This last one is very important, because at the end of the 19th century here started the actions of the Romanian Upraising from the Austrian-Hungarian Empire. So, Putna and the grave of Stephen the Great were symbols for the independence of the nation. Stephen loved very much the culture and not only the Eastern one. At his court were poets, doctors and literate men from the Western countries, and he corresponded through letters with many rulers from the West. After the big battle of Vaslui (1475) where he won against Mehmet II, the same who conquered the Constantinople, His Holiness, Pope Sixtus VI named him Athleta Christi, and thought about the possibility to open a new battle against the Turks. Anyway, the plan never realized. In the next year, 1476, Stephen found himself alone against a big Turkish army and looses. He was almost to run away from the country, because none from the Western Kingdoms helped him, but after the advice of the monk Daniil, he starts the war again. In the end, he would be obliged to make peace with the Turks, paying an annual tribute in money and different materials. Another fights sent away Matthias Corvinus (Baia, 1467) and John Albert of Poland (Codrii Cosminului, 1497), establishing the independence of the country against Hungary and Poland. After a glorious kingship, Stephen died on 2nd of July 1504. The funerary cortege went from the capital of Suceava to the Monastery of Putna (about 70 km) and the chronicles registered that a lot of people came to the funeral as crying after their own father. Interesting to say, that after the popular television contest, known as “Mari Români” (The greater Romanians), which also happened in some other countries, Stephen the Great was voted the Biggest Romanian from all the times, being followed by the King Carol I (1866-1914). This question came and still comes today in our media and press. Stephen was quite harsh with his enemies. Furthermore, he had three wives and many other illegal adventures. As an example, his illegitimate son, Petru Rareş is the most known son he had, and also voivod of Moldova, after his official brother, Bogdan III (1504-1517), because he was promoted in this position by the Turks, through his intelligence and money (1527-38 and 41-46). Being saint or hero, these are two different things, but his canonization was not only a nationalistic business of the modern Orthodox Church in Romania. The first reason of being a saint, is that of protecting the Church in Moldova and helping it. 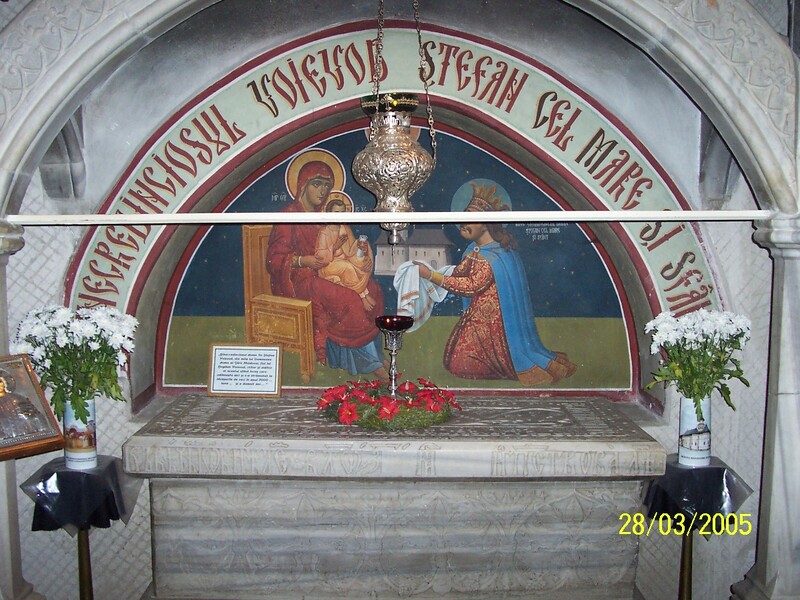 Stephen is well known also by helping the monasteries from the Mount Athos, who were at that time in a very difficult financial situation, and in danger to be sieged by the Turks. Of course, financing the Church doesn’t mean automatically the saintness. But Stephen is known through the contemporary chronicles as a very faithful voivode, who was respecting all the Church traditions, such fasting, praying, helping the poor and the widows and so on. The second argument of being a saint is, that he was a very just voivode, a strong fighter against corruption and lies, strongly practiced in the Middle Ages. But not only his justness was the quality of the voivode. He was a very modest man, living in a modest home, and exercising the virtue of humility in front of the priests, monks and other men and women of God. We mentioned already his humble attitude after a war, fasting and praying for the dead soldiers, equally if his own, or the enemies. The second argument, quite unknown since a few years, is the way he died. It is well known that he crowned his own son even before his death. In the Middle Ages, the laws in Moldova stated that they cannot be two voivodes simultaneously, so probably he entered in the monastical status. Eve if that was not confirmed by the chronicles, in the middle of the 18th century his grave was opened, and his Relics were found in the Porphyry robe, usual for the voivodes. Still he had no coffin, but his body stand on 13 iron bars, and under his head was found a brick. Those things can attest the fact that Stephen died as a monk, such as also some of his successors, like Alexandru Lăpuşneanul (1552-61 and 64-68). Finally, for the Eastern Christianity, the process of canonization differs from the western one. The necessity of the relics, or of the miracles is not obligatory. Instead of it, the popular veneration of a saint and the orthodoxy of his faith are obligatory, in order to proclaim him officially. That was also the old practice of canonization, because in the first centuries there’s totally unknown any process of making someone as a saint. In this way, the Holy Synod of the Romanian Orthodox Church proclaimed him as a saint on 2nd July 1992, during a big feast at the Monastery of Putna. The celebration of 500 years after his death, in 2004, was a National Holiday.